The Athletic Center was full of music, laughter and singing on November 9, as part of an Africa in America workshop that came to Pacific Ridge throughout the week. 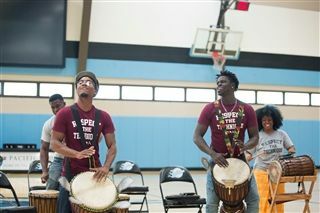 Musician and choreographer Kara Mack taught students about the importance of music in West Africa. Ms. Mack worked with cast members from the upper school musical, Once on This Island, to bring their storytelling to life in a workshop that featured live drummers and an exuberant dance style. The next day, during Community Life, students learned the lyrics to a traditional song while accompanied by vivacious drummers. Members of the musical joined Ms. Mack by demonstrating their new West African dance in front of the school. The whole athletic center was moving to the beat!